Are investors joining rally too late? Investors are on track to plow the most money into stock funds since the technology bubble burst in 2000, according to investment research firm TrimTabs. Should that be a cause for concern? Perhaps. Investors have poured $277 billion into stock-based mutual funds and exchange traded funds through Oct. 25. In 2000, $324 billion went into these funds. And even with the Dow and S&P 500 at all-time highs, investors continue to pile into stocks. As of Friday, inflows for October had reached $50 billion, making it the fifth largest monthly inflow on record. The top two months of inflows both happened this year: $66.3 billion in January and $55.3 billion in July. "The inflows we've seen this year have definitely been extreme," said David Santschi, chief executive of TrimTabs. Meanwhile, investors have been pulling money out of bond funds at the fastest clip since ... you guessed it ... 2000. Mutual funds and ETFs that invest in bonds have reported an outflow of $31 billion so far this year. Thirteen years ago, $50 billion was pulled out of bond funds. Why this may not be another bubble: All of this begs the question, is the market headed for a repeat of 2000? It's tempting to draw this conclusion given the rich valuations that many technology companies currently enjoy. Netflix (NFLX), Tesla (TSLA) and Amazon (AMZN) come to mind. But there doesn't seem to be the same level of "irrational exuberance," to quote former Fed Chairman Alan Greenspan, in today's market. "Predicting market tops with fund flow data is not an exact science," said Santschi. "But it's a good contrarian indicator." 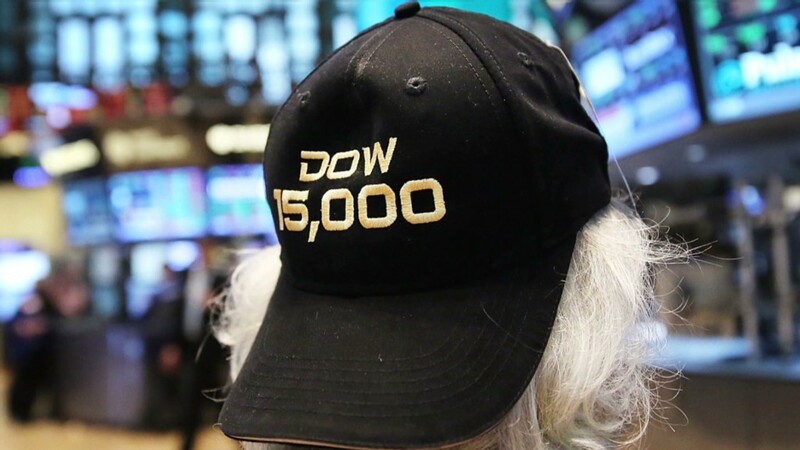 Some experts have dubbed this the most hated bull market in history. Many investors say the Fed is pushing them to own stocks by holding short-term interest rates at record lows and keeping a lid on longer-term rates with its $85 billion in monthly bond purchases. Last one in? Last one out? The conventional wisdom on Wall Street is that retail investors, who are the main participants in mutual funds and ETFs, tend to jump into stocks just before the market reaches a top. That was the case in 2000. In the three months leading up to the Nasdaq's peak in March 2000, investors put more than $138 billion into equity mutual funds and ETFs, nearly half of what was invested in stocks for that entire year. Investors continued to put money into equity funds until Feb. 2001, although the pace slowed as stock prices continued to plunge. However, the idea that small investors come late to the party does not always hold true. In a paper published earlier this year, Birinyi Associates found that only four of the past nine bull markets followed this pattern. 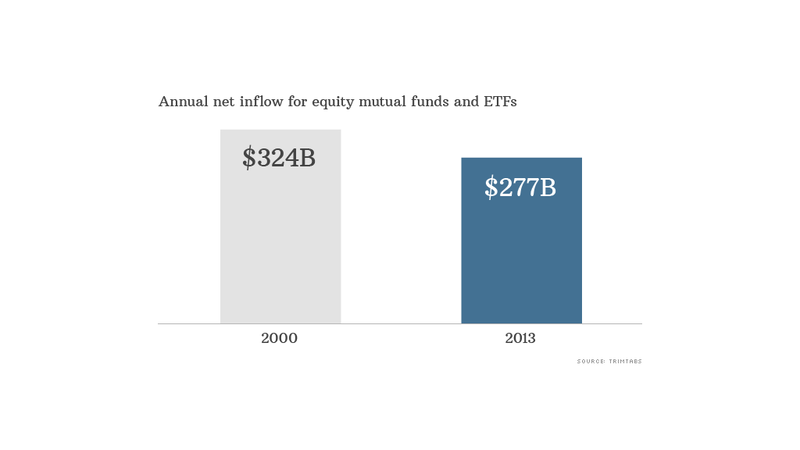 In the other five, equity fund flows were the highest at the beginning or in the middle of the cycle. In other words, the average investor got in early or only shortly after stocks started to surge. This happened most recently during the bull market that began after the 2000 tech crash. Investors started to heavily pour money into stocks in March 2003, getting in relatively early on a run that lasted until October 2007. Kevin Pleines, an equity analyst at Birinyi Associates, said that his firm has looked at bull markets going back to 1962. He dismissed the notion that the general public gets into stocks too late as "market lore." Pleines acknowledged that equity inflows this year have been "notably positive," but he said inflows have not reached "a level that leads us to believe that the public is 'all in' on stocks." So it's not that investors are necessarily excited about stocks. There just aren't any better alternatives for investors right now.